Holiday shopping on an empty stomach can be a drag, so it’s important for shoppers to keep their appetite satisfied this holiday season. Never fear, though, The Foodies are here with a list of some of the best lunch spots around town. So pop in for a bite during your shopping spree to make sure you’re on your game. Just off of Main Street in the heart of Huntington village, Christopher’s offers a daily, $9.99 lunch special, with offerings cycling in and out, such as the a ham and cheese sandwich, choice of soup, and a glass of wine or beer. Moving on to the standard menu, there’s a well-rounded menu selection of pub fare, including burgers like the Aloha Burger. It’s adorned with grilled ham, grilled pineapple, cheddar jack cheese and jalapenos and smothered with sweet chili sauce. Looking for something a little lighter? Try the Shrimp and Avocado Salad, which melds a succulent and smoky shrimp flavor with fresh avocados. It’s also dressed with chickpeas, tomatoes, onions, cucumbers drizzled with a cilantro lime vinaigrette that accents the salad with an upbeat, citrusy flavor. There’s plenty more on the menu and, if you’re there for a late lunch, be sure to indulge in happy hour at the bar from 4-7 p.m. with half-priced drinks and appetizers. Christopher’s is open Monday-Saturday, 11:30 a.m.-4 a.m. and Sunday, 12 noon-4 a.m.
Found among the quaint shops and boutiques of Cold Spring Harbor, The Gourmet Whaler serves up fresh-made salads, burgers, and sandwiches that make it a perfect lunch stop for busy shoppers. For those who have worked up a big appetite, the “Killer Whale” Burger combines a 12-ounce patty with lettuce and tomato on a Kaiser roll (with the option to add cheese and/or bacon). For something lighter, try the Turkey Club Sandwich with sliced turkey breast and hickory-smoked bacon, or perhaps the “Bird In Hand” Chicken Salad, which is served as a salad and brings together chicken blended with curry powder, salt, pepper, walnuts and celery with a touch of mayo. Of course, don’t miss The Gourmet Whaler’s staple — its Famous Fish Tacos, which are served with chipotle mayo, peach mango salsa and signature coleslaw. The Gourmet Whaler, which also serves breakfast, is open Sunday-Wednesday, 9 a.m.-6 p.m.; Thursday-Saturday, 9 a.m.-8 p.m.
Roast Sandwich House, found in the heart of Melville, offers up a selection of salads, panini, soups, and, of course, sandwiches, for 110 Corridor shoppers who need to satisfy their hunger craving. Everything served at the shop is all-natural, including whole roasted meats, homemade bread, and fresh produce. One of our favorite sandwiches is the Crispy Chicken Alla Vodka, which brings together fresh mozzarella, Parmesan and basil on garlic semolina hero. The House Salad, meanwhile, is a lighter offering of mixed greens, tomatoes, cucumbers, croutons and balsamic vinaigrette, making it the perfect candidate for a quick bite before heading back to the stores. 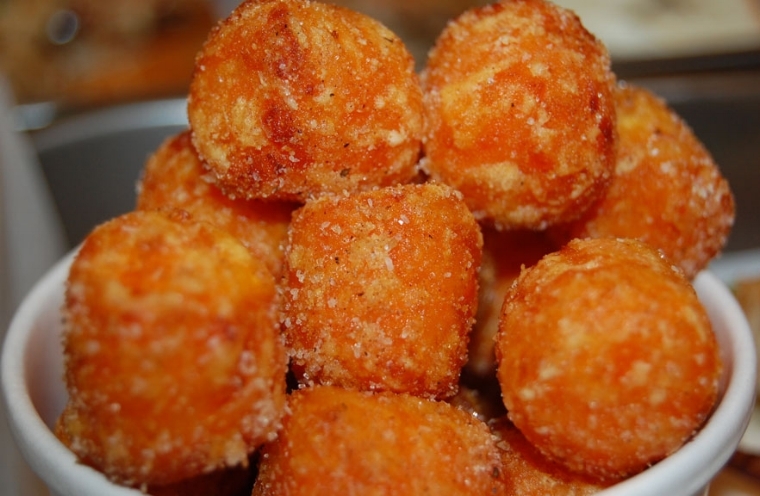 Regardless of your choice, be sure to get a side of Roast’s famous sweet potato tater tots, which are served with cinnamon and sugar. Roast is open Monday-Saturday, 10:30 a.m.-8 p.m.
Greenlawn’s Ruvo restaurant and bar offers up a $12 lunch menu that’s perfect for that mid-day craving. There’s a selection of sandwiches, flatbreads, salads and entrees that are sure to hit the spot. Some of our favorites are the Chicken Parmesan sandwich, which is served with either house fries or a side salad. Salad choices include the Mesclun Mix, which is made up of cherry tomato, radish, shaved percorino and balsamic vinaigrette. For a little more, the lunch menu expands with dishes like Shrimp Scampi ($17) and a Lobster Mac & Cheese ($16) skillet that’s served with balsamic salad. As for desserts, they’re all $5. Just like Christopher’s, those having a late lunch might be able to catch happy hour, which is 4-7 p.m. from Monday-Friday (until 8 p.m. on Thursday). The restaurant itself is open Monday-Thursday, 12 noon-9:30 p.m.; Friday-Saturday, 12 noon-10:30 p.m.; and Sunday, 11 a.m.-9 p.m.
A staple of the Northport Village community, Tim’s Shipwreck Diner has a lunch menu that’s sure to satisfy. Start with the soup of the day, or perhaps mozzarella sticks. Then, move to entrees like the Hot Homemade Pot Roast Muenster Gravy on a roll, or Asparagus Ham Chedder Quiche, which is served with either soup or salad. There’s also the savory Marinated Skirt Steak, which is served on a roll with sautéed onions and cheddar, alongside a side of fries.